Artist's conception of what might have been..
Jimmy was scheduled to be on the Late Show, but was bumped because of time restraints. 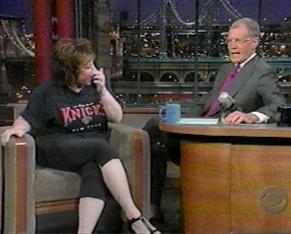 Letterman thought that a luggage bit was a lot funnier than it actually was, so he dragged the bit on. Combined with the great time he had with Roseanne and a song by Susan Tedeschi, there wasn't enough time to interview Jimmy. What a flop! 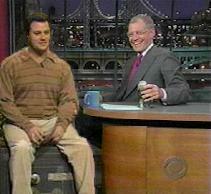 Letterman was kind enough to plug The Man Show's premier and give his apologies to Jimmy and his family. Here's what we saw instead.